Check out behind the scenes video of the making of “Ye vs. the People”. On Friday (April 27), Kanye West premiered his new song, “Ye vs. the People.” The track finds T.I. and Kanye going back and forth debating Kanye’s recent support for Trump. 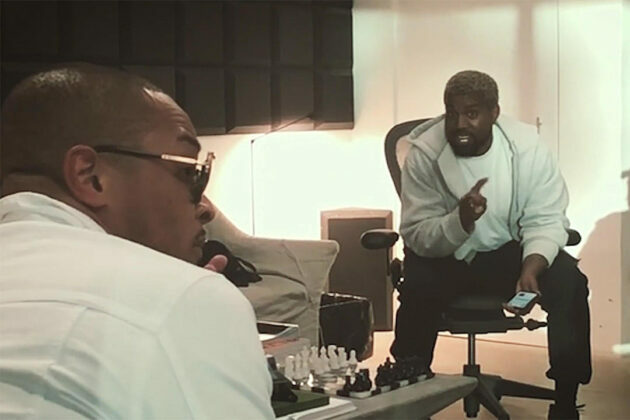 The video features Kanye, T.I., producers Pi’erre Bourne, Mike Dean and more in the studio session. Also, in the clip, T.I. tries to understand why Kanye is supporting Trump. Elsewhere during their chat, Kanye speaks about his decision to wear a “Make America Great Again” hat and what it represents. Author streetsPosted on May 1, 2018 Format VideoCategories NewsTags kanye west, pierre bourne, t.i.